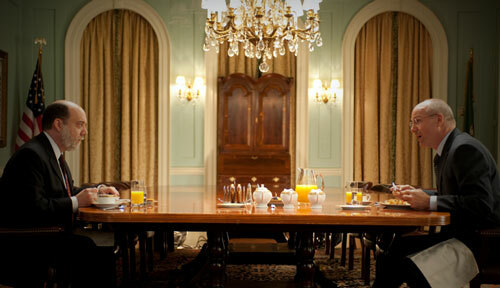 The fiction of pervasive cluelessness is so vital to this movie’s very essence that the CNBC clips interspersed between scenes as a narrative device had to be “reread and, in some cases, reshot”—faked is another way of saying it—by some of Cramer’s calmer/comelier colleagues two years after the fact, on an HBO set designed to look more like that of The View or Reliable Sources than anything on CNBC. Freed from the sweaty, disheveled realities of the moment, Maria Bartiromo looks as if she’s aged herself back to the days of Glass-Steagall. BB: I … hope they use the money the way we’re asking them … they will lend it out, won’t they? HP: (grins) Of course they will! !